Aries, in April 2018, you will find relief among the trees. Resting in nature, that's what you really need. A fairy tale would not be a fairy tale if it would miss a magical golden fish – a kind of natural miracle. According to the horoscope, your wishes will come true in April, but only if you can get rid of the city's noise, technology, or the Internet in general – to relax, to free yourself. Aries, the ideal time for any change (or exchange of something for something else) is coming. Whether you're heading to the New York Stock Exchange or if you just want to take part in a neighbours clothing bazaar or just replace the colour of your household wall paint. The horoscope says that April is simply an ideal time for Aries. The Horoscope reminds Taurs that in April 2018 you can fully enjoy the scent of wood and other natural materials. It also seems that Taurs will unexpectedly play the role of a teacher what may also help creating a new and unexpected love or a flash of emotions. 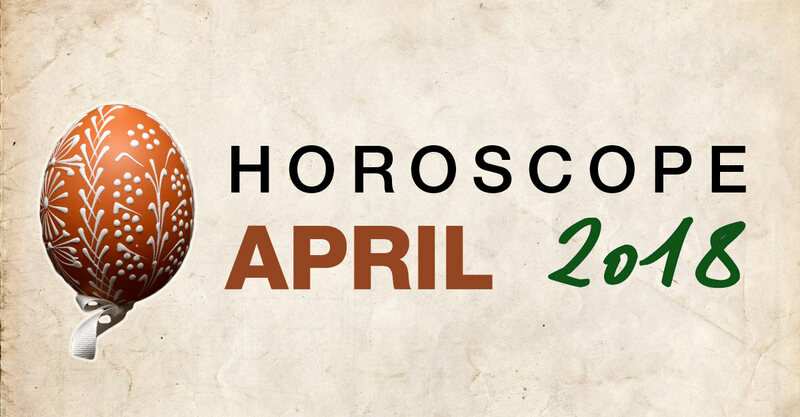 Taurus can expect some bold adventures in April such as, for example: 1) in the near park you may surprise a bunch of naughty kids who are planning the dissection of a living frog, or 2) you may also help your neighbour to solve some tricky mathematical or detective mystery. April, according to the horoscope, will boost people born under the sign of Taurus. There is a chance of increasing the self-esteem. In April 2018, Gemini can be surprised by infidelity. However, often it's not important what really happened, but the plain fact that you or your love got into suspicion matters. The horoscope highlights that uncertainty can affect Gemini's life immensely. The horoscope also reminds you that is not possible to simply buy confidence in a supermarket. Gemini, don't panic. If you don't hide anything, things will do well. In April, Cancer may resemble a bat. Thus, the ideal time for self-realization may be during the night. At the same time, Cancer can think about the old sayings "fine feathers make fine birds" and "the tailor makes the man". Trees, as well as you, will bloom in the spring! The horoscope suggests that in April no one but Cancer will have the ability to redefine concepts such as "boutique", fashionable "trend", amazing "model" or breathtaking "show". The fourth month of 2018 will be typical by the helpfulness of Leo. People born under this zodiac sign may understand the true positive meaning of the proverb: "what goes around comes around". Leo may soon appreciate the real and pleasing response from others. Simply said, people will behave friendly to Leo. We can also read a parable of the spruce tree in actual horoscope. When touched the coniferous tree may be unpleasant but it is durable and it will last even in cold winter. So, be inspired by people who will teach Leo how to deal with difficult conditions. Scorpio, April will be the steering wheel of 2018. Many features that will determine the rest of 2018 will be born and shaped in April. The horoscope advices to all men and women born under Scorpio to put on boxing gloves. You will have plenty of time for meditation later. Now get ready for a storm, a 100-meter sprint and a treasure hunt in the deep forest. Of course, this all is a small hyperbole, but the horoscope actually heralds the time of "action". Scorpio may look forward to all such adventures and will, in the vast majority of cases, end up on the podium. Capricorn, the horoscope for April 2018 predicts that you will face many special experiences. You will be able to perceive even the hard times with necessary humour. Maybe you know the "Clown care" program. We don't suggest you should become one of their members or contributors, but these people are a good illustration of a positive mood even in difficult times, which is now an important skill for Capricorn. Whether it's a challenging run where you start to lose your breath, or whether you have to untangle snakes (you can figure out how to solve an unpleasant situation) – Capricorn will definitely solve all difficulties in April. Aquarius, April will be the month of rapid development. People born under this zodiac sign will be particularly active in society and on social networks. You can expect that if something has to bother you in 2018, it will start doing so in April! Old love or a whole new one. A truthful assistant or, conversely, a dishonest boss. You will soon find out what can "unhinge" you. The April horoscope for 2018 reminds Pisces that the wheel of fortune is spinning tirelessly over and over again. Cold winter snow alternates a warm summer with fragrant flowers and juicy fruits. The harsh moments are blown away by the fresh wind of new pleasant experiences and opportunities. It's hard to tell if in April Pisces may look for an amazing holiday, an unexpected encounter, a generous gift, a win or just a better mood than usual.